With clients who are mostly Fortune 1000 companies from across the globe, Outsource2india specializes in providing technical assistance for multi-storied building design for world-class structures as well as landmark buildings. We help our clients with economical designs, technical superiority, and usability. Along with dynamic analysis & design of dynamically sensitive and critical structures, our team of adept drafters and modelers are proficient in providing reinforced concrete, steel concrete and other steel framed composite constructions, masonry, timber, aluminum as well as glass structure design and analysis. Combining years of experience with a global delivery model and advanced technical know-how, Outsource2india is a partner by choice for many of our clients to grow their client base. With our extensive knowledge & expertise in high-rise structures design and analysis services, we ensure satisfying results with an eye on time and cost saving techniques. Outsource2india comes with close two decades of experience in providing design and analysis services. We have served thousands of customers that include, architects, engineers, manufacturing firms, construction companies, etc. We provide enhanced structural design services for not only building designs but also functionality, elevation projections, sectional details received from architects and builders to cover all aspects related to serviceability, safety, and durability of the structures. Our efficient team of drafters provide building structure analysis on live load, dead load, wind load, earthquake load, etc., to ensure the building designs follow specific industry standards. We provide accurate details to guide the construction and execution teams thoroughly. Our high-rise structure design and analysis services offer high-quality and economical way to meet tight budget requirements. Industrial Structures including Steel Plants, Oil Refineries, Chemical Plants, and Warehouse, etc. Our strategic approach allows us to develop well-envisaged building designs that assure improved look and feel. Why Choose Outsource2india for High-Rise Structures Design & Analysis? Outsource2india has made a mark in the industry as a reliable engineering support services provider for assisting a growing number of clients on their complex projects for both commercial and residential construction projects. With 20 years of experience in engineering services, Outsource2india understands the importance of safety, strength, and efficiency when it comes to structural design & analysis and our team ensures all our structural drawings are qualitative and delivered to meet expectations. Most structural engineering design projects are carried out at our global delivery centers by utilizing latest technologies and sophisticated analysis software tools to ensure maximum efficiency. O2I's team can also work as an extension of your in-house team as well. 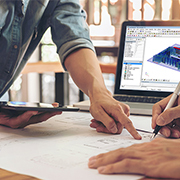 Our experts can help you identify potential design issues and offer apt design solutions to overcome critical challenges. If you have decided on outsourcing high rise structures design and analysis to India look no further. Contact us today to understand how our team can work as an extension of your in-house team to provide you a wide range of engineering solutions for your high-rise construction projects.